Trump’s move to displace the legitimate head of the Consumer Financial Protection Bureau assaults consumers—and violates the rule of law. There is a tendency to presume that a “constitutional crisis” must involve generals exercising unwarranted authority in a clash with civilian leaders—or a president firing an FBI director because he feels threatened by inquiries into wrongdoing by that president’s aides and allies. But some form of constitutional crisis can occur whenever competing views of how the federal government should operate clash with one another. The crisis becomes severe when one side of the disagreement chooses to assert its position by disobeying laws that are on the books in order to achieve political ends. That’s what is happening now with the Consumer Financial Protection Bureau. 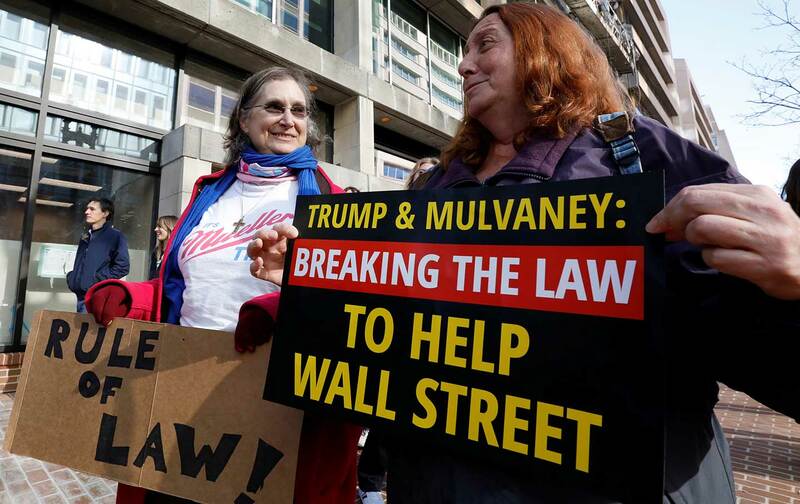 The CFPB is an independent agency with clearly defined mandates and rules, spelled out by the Dodd–Frank Wall Street Reform and Consumer Protection Act of 2010, which created the agency. When CFPB director Richard Cordray stepped down this month, there was no mystery as to who should succeed him. The Dodd-Frank law says that the deputy director “shall serve as acting director in the absence or unavailability of the director.” Before his exit, Cordray named his able chief of staff, Leandra English, as deputy director. That set English up to serve as acting director until President Trump nominates a new director and that nominee is confirmed by the Senate. But President Trump, whose disrespect for independent agencies has been well established, and who had been particularly critical of the CFPB, had other ideas. He named Office of Management and Budget director Mick Mulvaney as the acting director. [The] law that Congress put in place specifically says the deputy director takes over when the director is absent or unavailable. So if we’re going to have a deputy director who’s going to take over on an interim basis, it ought to be done according to the law. There’s no vacancy here for Donald Trump to fill. Dodd-Frank does not say that she “may” serve. It doesn’t even say, as other statutes do, that she “shall serve” unless and until the President appoints someone else to do so.… In such cases of an unequivocal, mandatory statutory designation of the acting officer, the argument goes, the President may not exercise his appointment authority under the VRA, because Congress itself has already settled the question of who serves. it’s forced the largest financial institutions in this country to return about $12 billion directly to consumers they cheated. It’s handled about 1.2 million complaints against student loan outfits, against the big banks, against different kinds of lenders, and that’s a reason that a lot of these big banks really don’t like it. Trump, for all his “drain the swamp” talk, has deferred to Wall Street in general, and to Goldman Sachs in particular, from the moment he set foot in the White House. Mulvaney had no authority to order those actions. “The President’s attempt to install a White House official at the head of an independent agency—while allowing that officer to simultaneously serve in the White House—is unprecedented,” says Deepak Gupta, a lawyer for English who has asked the courts to clarify that the deputy director is in charge until the Senate confirms a replacement. “The law is clear,” explains Gupta. Unfortunately, that clarity was lost on the conservative jurist who heard arguments for an emergency request to block Trump’s appointment of Mulvaney. On Tuesday afternoon, Judge Timothy J. Kelly of the Federal District Court in Washington — who was appointed this year by Trump — denied the request. The legal wrangling is likely to continue. But, for now at least, Mulvaney has claimed his place in the director’s office and is issuing edicts that are designed to stall the CFPB’s operations. The savvy folks at the National Constitution Center suggested on Monday that this represents “a minor constitutional crisis.” Perhaps. It is possible that things will be resolved quickly by the courts. But if this power grab allows Mulvaney to continue to make policy for weeks, even months, from an illegitimate perch, the crisis will no longer be “minor.” And if Trump concludes that he has leeway to disregard laws, rules, and the US Constitution itself when it comes to making interim appointments, the crisis will grow. Just imagine if Democrats were to retake control of the US Senate in 2018. What would happen if Trump simply decided to make a slew of interim appointments to top positions, with no regard for the “advise and consent” process that gives the Senate the authority to accept or reject nominees? When we are talking about President Trump, who has already disregarded the Constitution to an alarming extent, the prospect is daunting.